WOWCAST BLOG: Bring back the Zombies! This all reminded me of the corrupted blood bug back a few years back. 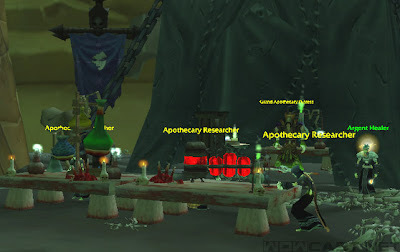 Also, I recall hearing about scientist wanting to use WoW and the corrupted blood model as a study of a rapid infectious disease and social reaction. It appeared to me that Blizzard took what they learned from the bug that was corrupted blood and made a model that might be interesting to dissect. Real shame how they suddenly stopped it. Of course it was the winy people wining about it. it was the most amazing fun while it lasted though. that's awesome! I wish I could have been part of a mob! "Of course it was the winy people wining about it." The whiny people were only matched in the end by the a$$hats. The story line was stopped because it ran its course. A few days of the event with quicker and quicker incubation time should have been the giveaway that Blizzard never intended the infection to go on forever. It was a masterfully done world event in my opinion and its short time makes it all the more memorable as something we all had a chance to see and not some regular event that diminishes the fun. As with the corrupted blood bug, it was something for those that saw it to remember. I just hope its not something we see on a regular basis. You can only go to the well so many time before you realize its just water. That is of course, if the whiners don't force Bliz to bring this event back over and over again in lieu of good new content.